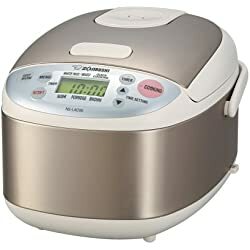 This page provides small rice cooker reviews of models that perform well yet offer users a compact size for conditions such as limited counter space, travel, or just preferring a mini rice cooker with a small cup capacity. Reviews of mini rice cookers with 3 Cup Bowl Capacities Only below. Probably one of the best units currently on this page is the Zojirushi NS-LAC05 3 cup rice cooker. This small rice cooker comes equipped with several rice settings that include white rice and brown rice, and uses advanced fuzzy logic technology to monitor how the selected rice variety is cooking by making subtle adjustments along the way. Think of this rice cooker as having a “brain” that will produce consistent high quality results after each use. Although a bit pricy, for folks who plan on making both white and brown rice daily and are seeking a compact cooker, this model from Zojirushi is a good place to start should it fit the budget. The 3 cup bowl size is good for making around 9 cups or so of cooked white rice and remains non stick. Also included is a special measuring cup (bowl is marked for precise water measurements) and scratch-resistant rice scoop. Another good small electric rice cooker to consider is this other great unit put out by Sanyo (S35K is black…S35S is white). Like the above Zojirushi cooker, this mini rice cooker uses fuzzy logic rice monitoring technology which we explained takes most of the guesswork out of preparing high quality rice, and has a slightly larger 3.5 cup bowl capacity good for yielding around 10 cooked cups of white rice. Settings aboard the Sanyo include white rice, brown rice, mixed rice, and sweet rice along with a quick cook option (lowered quality) and porridge setting. The unit also sports a bread baking setting and comes with a non stick bowl for easy serving and cleaning along with a rice ladle, measuring cup, and manual. For those who have limited or small counter tops, this cooker also helps free up clutter by sporting a retractable cord. Although these cookers do not offer fuzzy logic technology as like the above mentioned models, the Tiger JNP series cookers are one of the best one lever basic rice cookers available. Granted they are also some of the most expensive basic cookers too. Throughout our research of these cookers we have gathered positive feedback concerning the performance, rice quality (not as high as fuzzy logic, but still good), and overall durability the Tiger JNP rice cookers deliver. Some folks report their cookers still working fine for over 12 years. Some benefits include a great keep warm function, condensation collector, domed lid that prevents water from dripping on the rice, a retractable cord, stay cool carrying handles, and non-stick bowl. The sealed design helps prevent boil-over issues associated with cheaper cookers, and rice crusting on the bottom layer remains minimal. Folks will be interested in the Tiger JNP-0550 model as this is the smallest 3 cup version. For something a bit larger, also check out the 4 cup JNP-0720 model as well. 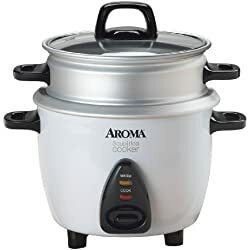 For a small rice cooker that is much more affordable than the cookers listed so far, we recommended folks check out the Aroma ARC-733G cooker and steamer. This is a 3 cup basic rice cooker that is very simple to use, just measure, add water, plug in and press a lever. The cooker does the rest and switches into a keep warm mode once complete. There is also a small steaming tray included with the unit allowing the user to steam food while the rice cooks below. 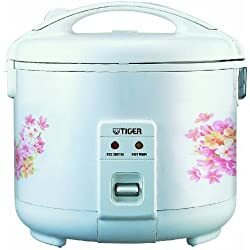 For a low price it is a good cheap small rice cooker for those who do not mind the sticking on the bottom layer as this is not a non-stick bowl. Just a small little con worth mentioning. We hope we provided the useful information folks needed to find the best small rice cooker that will benefit them the most.